A long writing session is spent in the morning, the internet available for a while, then not at all. The receptionist downstairs tells me he has no control over the service, as workers are working on lines that may have been ruptured as a result of monkey business (sic). As far as breakfast is concerned, he would recommend the noodle place on the corner, but judging the time of day, it is probably incredibly busy and I won’t get a seat. He points me further down the street to some other noodle place (don’t bother looking for options – this is east Asia, and people love their noodle soup), but I don’t find it, other than some grimy hole-in-the-wall places, and then some completely empty, glossier food court-style operation that would fit into a mall. The prices are modest, but the serving embarrassingly small – probably a very good reason why no one comes here. A baggie of grilled bananas in coconut syrup on the street corner, but they just aren’t that compelling when cold. Then into the small boutique coffee shop I saw yesterday evening that offers its own retro chic aesthetic so typical in Thailand. Perusing my map, the first stop of the day will be the Prang Sam Yot monkey temple, which I have been kind of dreading, although I made a point of taking nothing more with me other than the Lonely Planet guide and the camera, as backpacks could be an invitation to get attacked. Walking towards the temple, I can already see the macaques swarming on the street. I walk around the temple and on the far side, see a Spanish couple with guide adjacent the temple, covered with monkeys, occasional groups of young monkeys jumping on the two and swarming playfully. Presumably enticing for the great photo op, nevertheless I find the tourists’ brazen naïveté somewhat disturbing, considering that one small scratch or playful bite on their largely exposed bare skin could unleash some very unpleasant consequence. Oh well – you learn the hard way! A feeding frenzy ensues when what appears to be a temple warden in conjunction with private locals distribute copious amounts of food, including pineapple, cooked corn cobs, even bottles of pop, the largely juvenile monkeys writhing ecstatically at the possibility of getting any of the offerings into their little paws, and once they have, they settle down to eat their meal. The problem of monkeys possibly attacking visitors is hardly that serious if they are being fed to the degree I have seen here. On the other hand, if the monkeys hadn’t been fed, coming here would be a nightmare – and perhaps I was just lucky that I arrived at the right time! 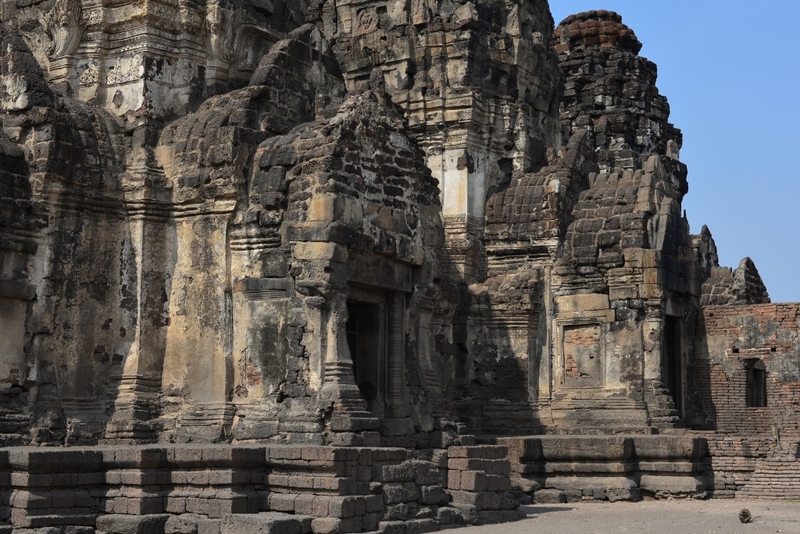 The temple itself is quite simple, laid out over a large lot composed of a combination of bare earth and parched grass, with three adjoining towers built in the Khmer Bayon style. The temple was originally a Hindu shrine built in the 13th century, the three laterite and sandstone spires supposedly originally representing the Hindu gods Brahma, Vishnu and Shiva. 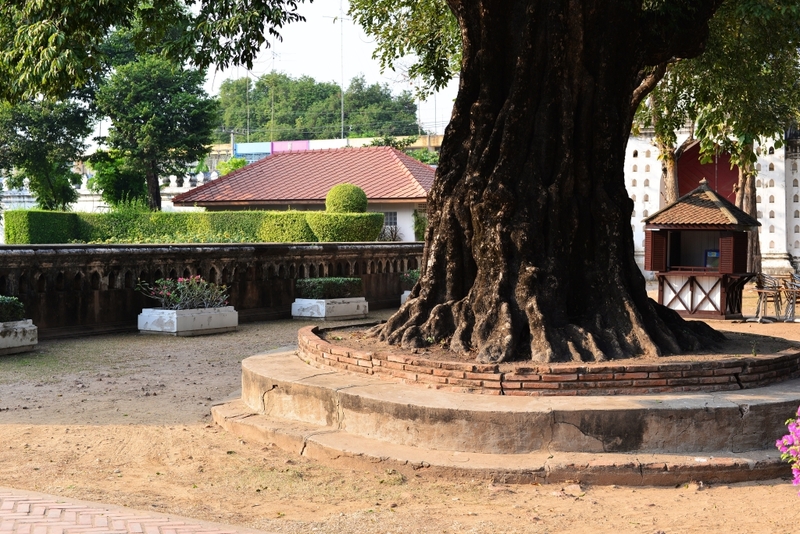 During the reign of King Narai, the shrine was converted into a Buddhist temple. A short visit to the simple and small Wat Nakhon Kosa east of the railway tracks, the stupa ruins almost embedded in the ramshackle wood and corrugated metal shacks mouldering amidst the brilliant bougainvillea, and then up Thanon Wichayan to take in more of the town’s attractions, of which it turns out there are surprisingly many. 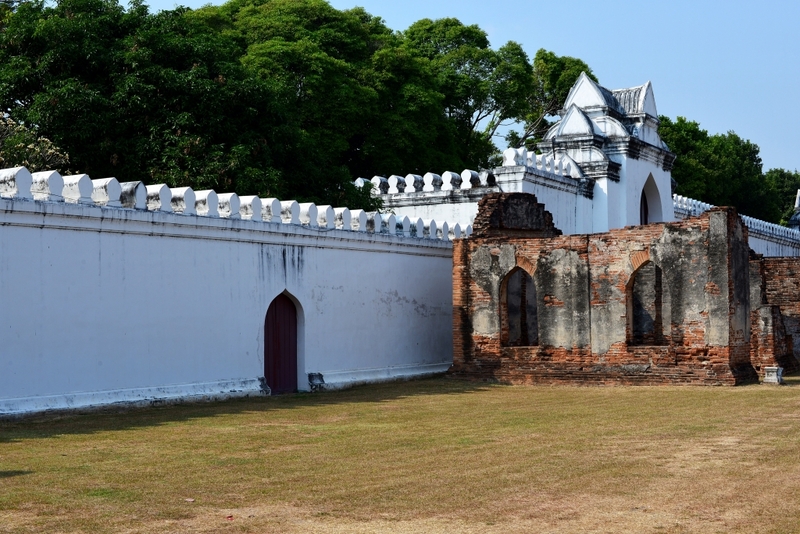 Prang Kaek is located on a small triangular patch of road, another originally Hindu structure that apparently dates back to the 11th century. 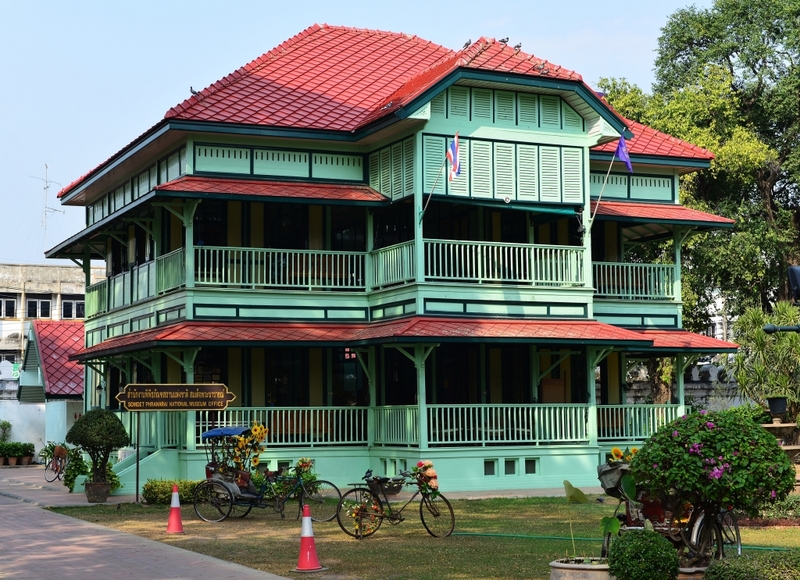 Much larger is the Ban Wichayan further up the street, a complex which served as a residence for envoys to the court of King Narai in the 17th century. 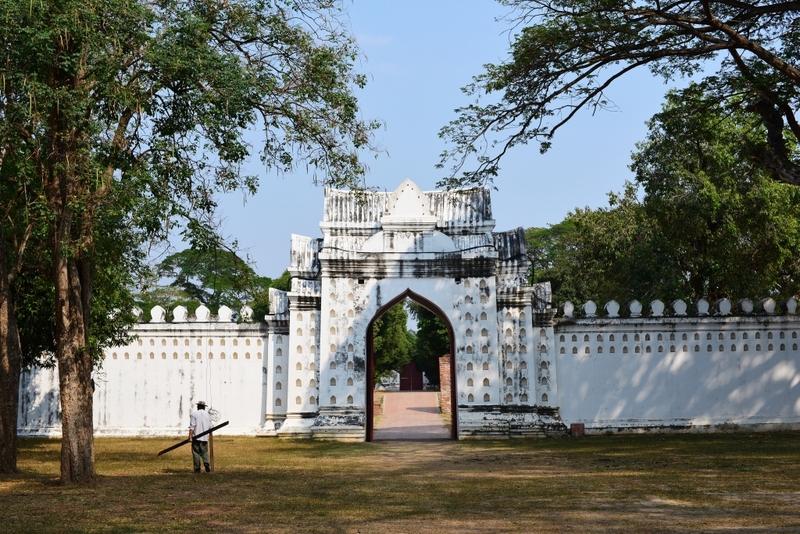 Ban Wichayan comprises a two-storey building made of bricks, a church, and a narrow and long one-storey building with an arched entrance in the west, built according to traditional European styles, intact structural pieces reflecting Roman arches and classical pediments above the windows . 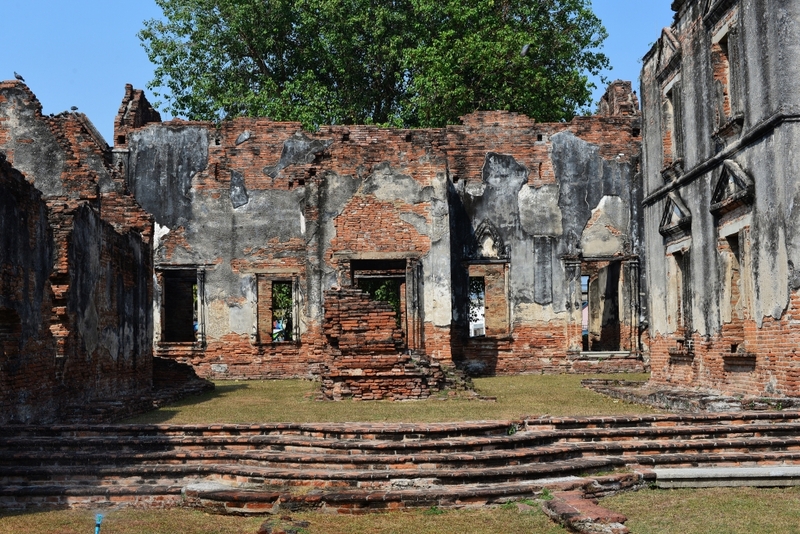 Sadly, I am the only visitor to this site, Thailand probably having far too many historic attractions, the most popular providing funds for the maintenance of the plethora of secondary sites that receive next to no foreign visitors. 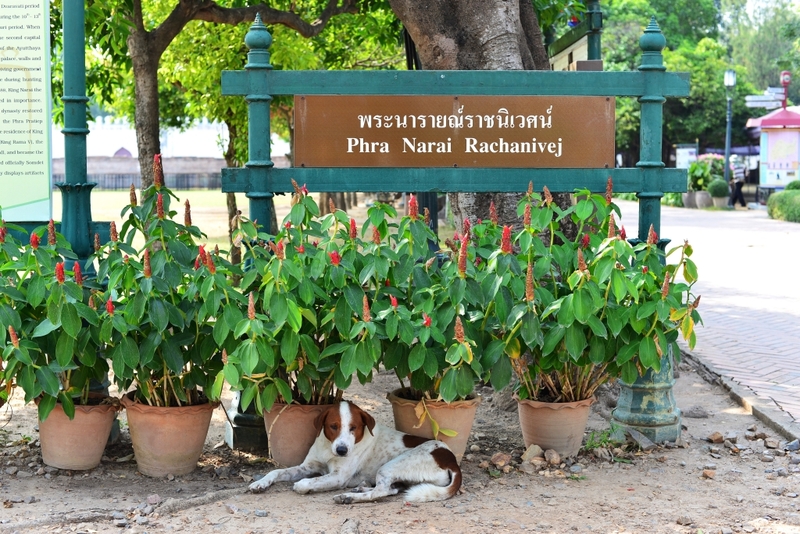 The Thai visitors probably don’t matter here, as they apparently get in for free. Walking along what I believe to be the perimeter of the river that encapsulates old Lopburi, another temple, small, well-tended businesses and residences, much more so that can be seen around the train station, and down the alley descending the turgid green river, an explosion of green, dilapidated warehouse-style shacks, a enshrouded woman clutching a fishing pole hunched in her canoe next to her floating cabin, neighboring houses also erected on floating platforms on the river. Next to the national museum I find a cute, Japanese-style crêperie offering all manner of sweet crepes, the consistency somewhat too rubbery for their own good. And just when I thought I had pretty well exhausted all the attractions of small Lopburi, I broach the expansive terrain of Wat Phrasrirattana Mahathat, a Khmer-style temple complex dating back some 800 years, the central and subsidiary prangs and other structures in varying stages of disrepair, slices of some prangs missing in their entirety, although small sculptural details are in part evident. Most structures reflect the essential architectural components and diverse styles that suggest the former grandeur that the site would have had. 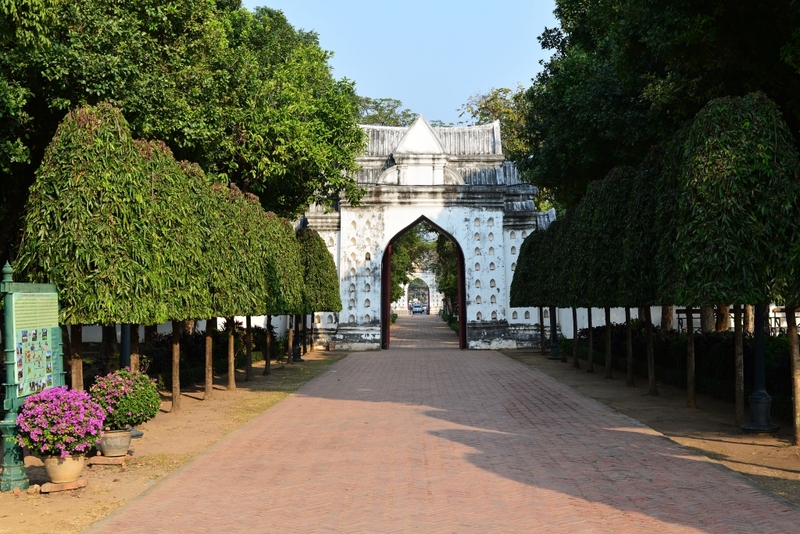 Wat Phrasrirattana Mahathat is as large as anything I would have seen in Ayutthaya, with sets of prangs organized within walled compounds, in addition to the remains of large meeting halls, cream and pink frangipani trees adorn the lot. Young couples use the relative privacy of the temple site to spend time together, while the ticket seller in the booth at the front of the lot waves to me to come and pay, as the back entrance I came through was wide open. Here as in all the other temples I insist on getting a ticket from the vendor, as they tend to simply pocket the cash and not disburse tickets, which would only serve to indicate that they are probably just pocketing the admission money. 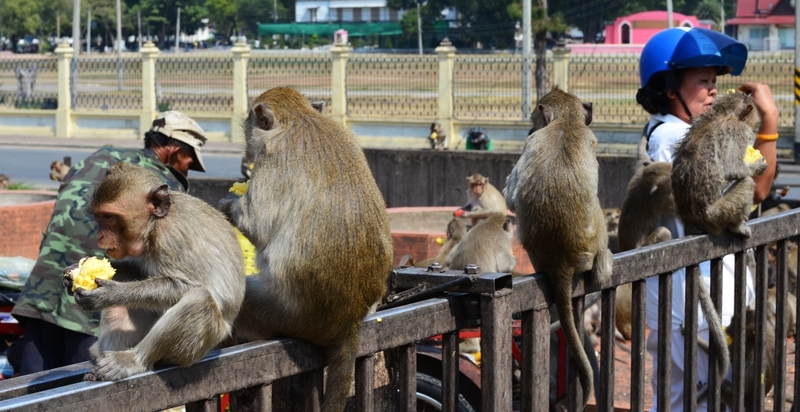 Notably, monkeys are really only a problem at the Prang Sam Yot temple, and even though there are few around in various locales, they are fairly cautious, as there are lots of street food vendors who don’t seem too concerned. 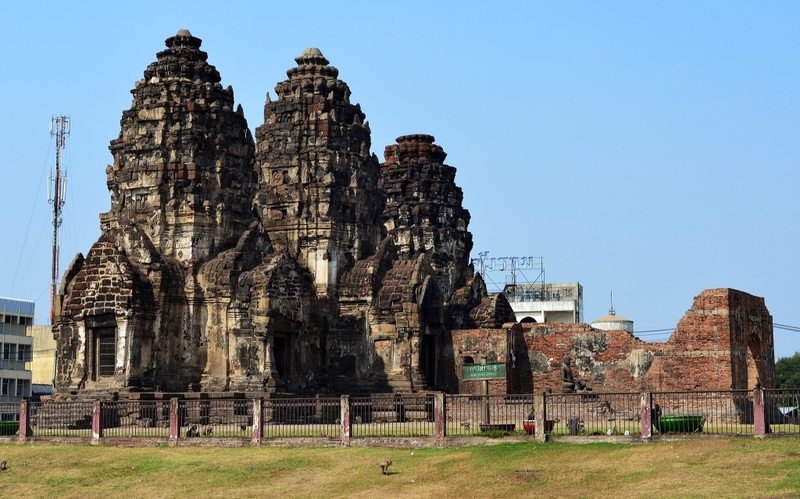 It seems at this point that three days spent in Lopburi may really be excessive, although I appreciate the far more relaxed pace I can enjoy as a result, never mind standing a better chance of being able to keep my journal updated and resolving some of the other issues I have to deal with. Loud traditional Thai music emanating from the large courtyard next to the art institute eliminates any possible appreciation of listening to my own music, even with headphones on, only to later morph into even louder techno, which is pretty ghastly, and I am only hoping that they will pull the plug on the noise sooner than later. I am dreading being kept awake all night listening to that dross – I could close the windows, but then the heat would become oppressive. Eventually I leave the hotel room again, and into another big market being set up in the streets leading around the hotel – in fact, throughout the core of the old town, which is fairly small anyway. Behind the hotel, in the midst of the melee of vendors, someone has decided to set up an entertainment centre with powerful loudspeakers which point directly at the hotel. By 8 pm or so the volume has been turned down, and by 9:30 it is off altogether, the market has dissipated for the evening. The food component of the market features many of the familiar gastronomic delights I have seen elsewhere on markets, including pre-cooked foods served in Styrofoam trays, miniature pastries stuffed with sweet bean, pineapple or some sort of spicy custard, seafoods such as diced or whole squid, skewered and ready to be grilled – or already grilled, soft candies, pre-sliced cakes, fish balls and surimi-based balls and sticks for grilling, miniature crispy crepe-like pastries, fried duck eggs, popcorn, and numerous other concoctions that seem imaginative but not necessarily culinarily memorable, although that isn’t necessarily the idea. Interestingly enough, very little of what is presented in terms of snack food here would be even vaguely spicy. 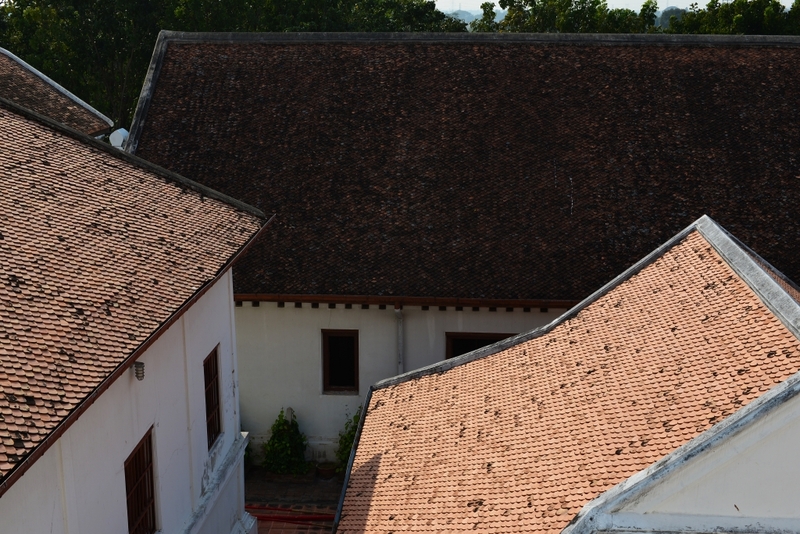 A torrent of pattering and banging on the corrugated metal roofs ensues as the town’s troupe of macaques hurtles through town on its early morning foraging expedition. My own foraging expedition for food lands me in the cafe at the corner of Wat Phrasrirattana Mahathat, where I am left somewhat baffled at the fact of being entirely ignored. I can appreciate that the single employee present is busy in the kitchen, but after he has prepared and served the evidently generous plates of fried rice and other preparations at a relaxed pace to the table at which two French men are seated, he continues to ignore me. He saunters by me and begins playing around with his cell phone, having ignored me the entirety of the time I was seated in his full view. I wasn’t particularly motivated to have Indian food, but the experience in the Indian place was very different from this establishment. I was just grateful for the fact that the owner addressed me from the get-go and continued speaking with me, despite being distracted by ongoing interruptions. 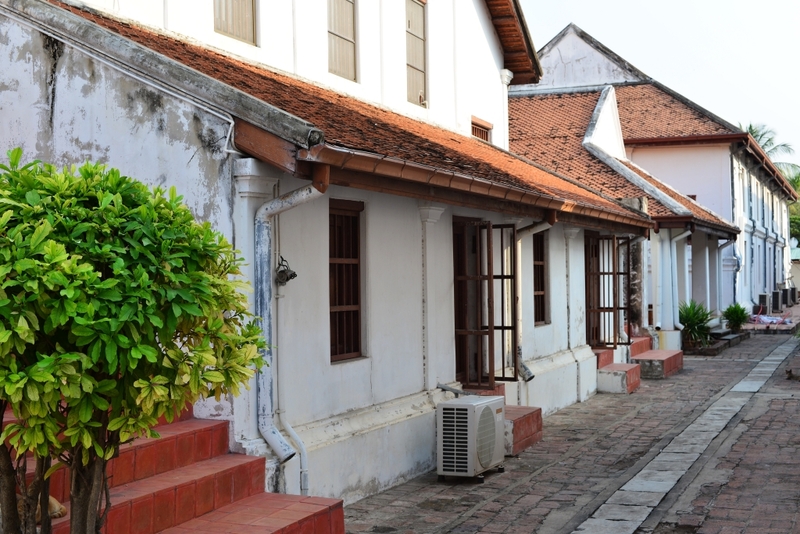 And it’s not as if old Lopburi is graced with a huge choice of restaurants, never mind authentic Indian restaurants being in vogue in Thailand to begin with. 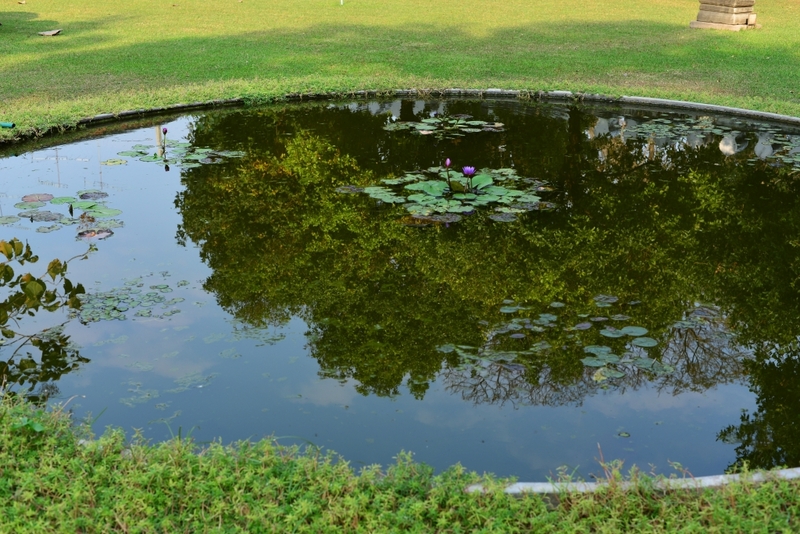 The young owner is from near Delhi and has been living in Thailand for the last 14 years, running an import/export business involving bringing Indian spices to Thailand and polyester waste back to India to be used for making carpets. He dismisses Thai food as being bland and unimaginative. Other than a few signature dishes the country is famous for and really stand out, most of the food is really forgettable in terms of texture and flavour – and no, you don’t need to spend a long time to figure that out. 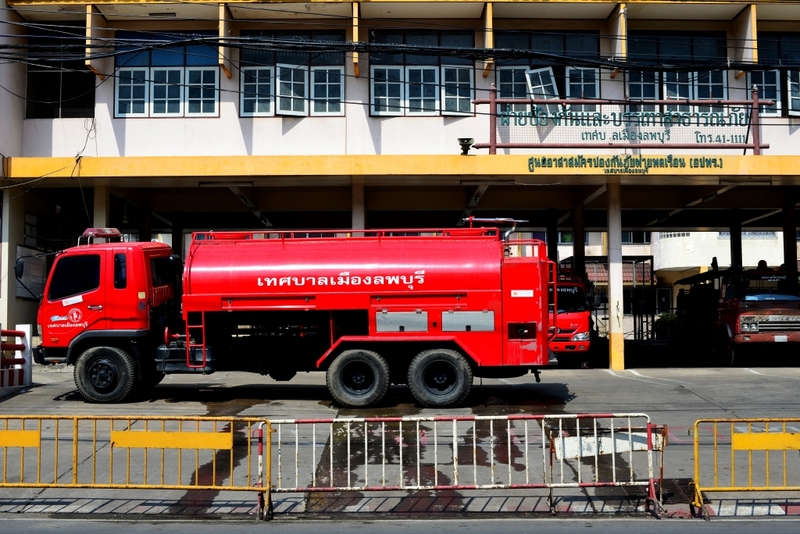 The days of Thailand being a laid back, easy going country are long gone – visitors have to watch every step and in the case of the most minor infraction foreigners are thrown out of the country. 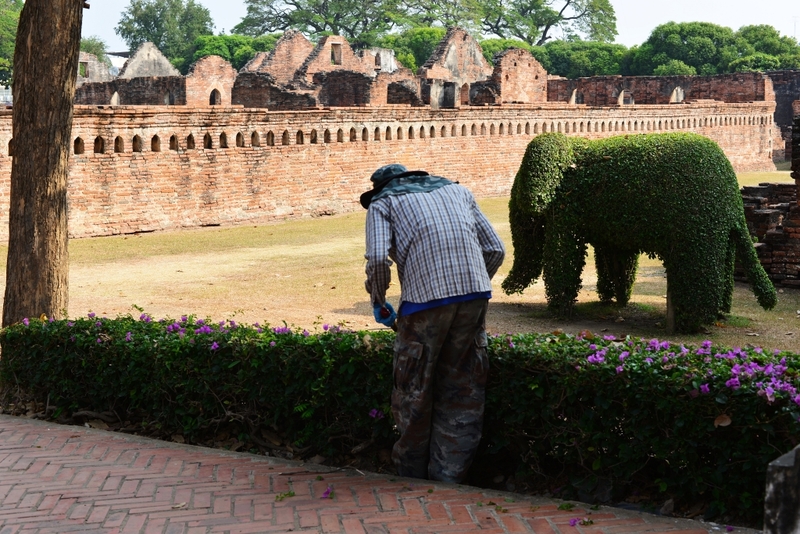 I reflect on the centuries of militaristic culture in the country and it would seem that the idea of Thailand ever having been that tolerant seems to have been an interregnum if anything. 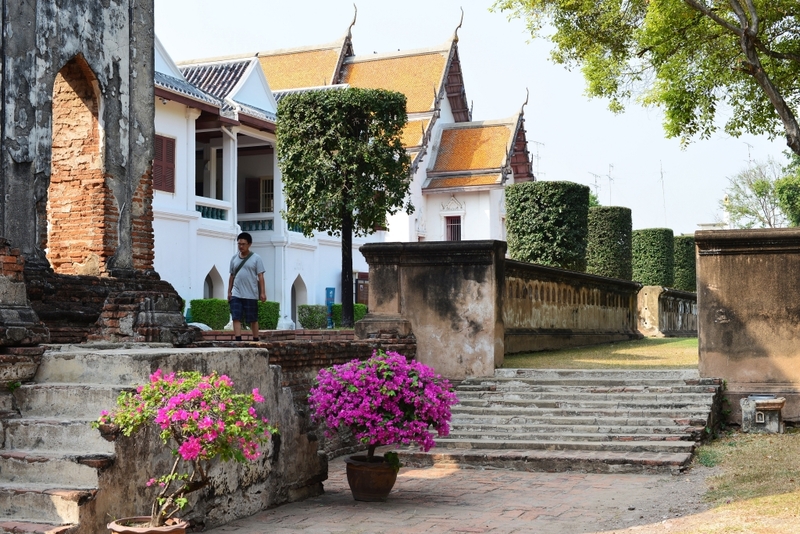 The entirely walled enclave of the Phra Narai Ratchanivet palace complex covers an expansive city block in Lopburi, and can be roughly divided into the ruins of the buildings established by King Narai during the Ayutthaya period and the new palace built by King Rama IV in modern times. 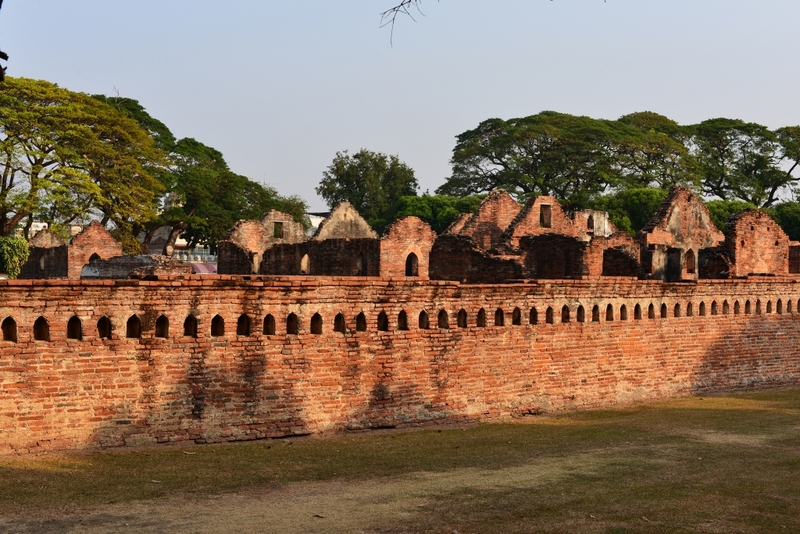 While the newer palace structure evidently follows European sensibilities, the earlier palace structures were in part designed and built by Europeans, reflecting the outward focus of the great Ayutthaya leaders. 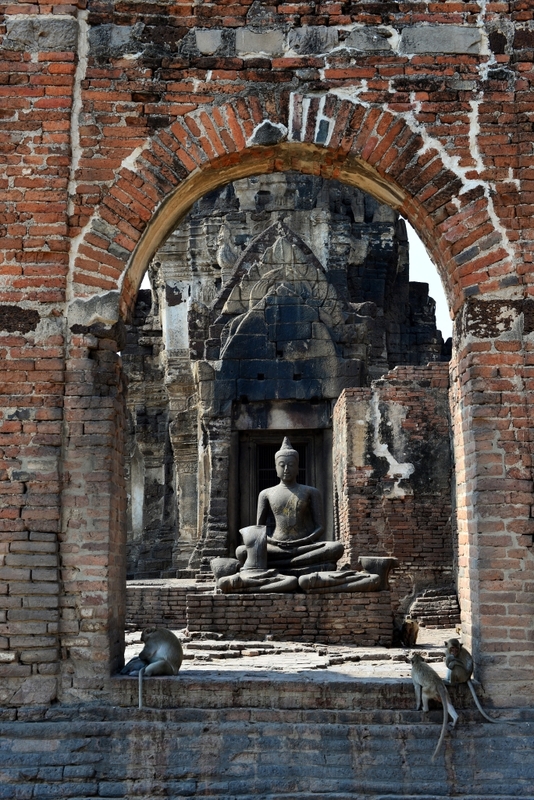 Lopburi rose to prominence in the late Ayutthaya period under King Narai, who built the city into one of the most prominent centres of the country, but following its apogee under Narai, Lopburi slid into relative unimportance, and not until the reign of King Mongkut or Rama IV did the city rise again to prominence as the second capital of the country. Rama IV was considered one the greatest rulers of Thailand in modern times, whose cultural and political sophistication allowed him to establish amicable and beneficial relationship with a host of foreign powers, ranging from China to the major European nations, and which in turn allowed Thailand to be neutralized from potential foreign aggression. 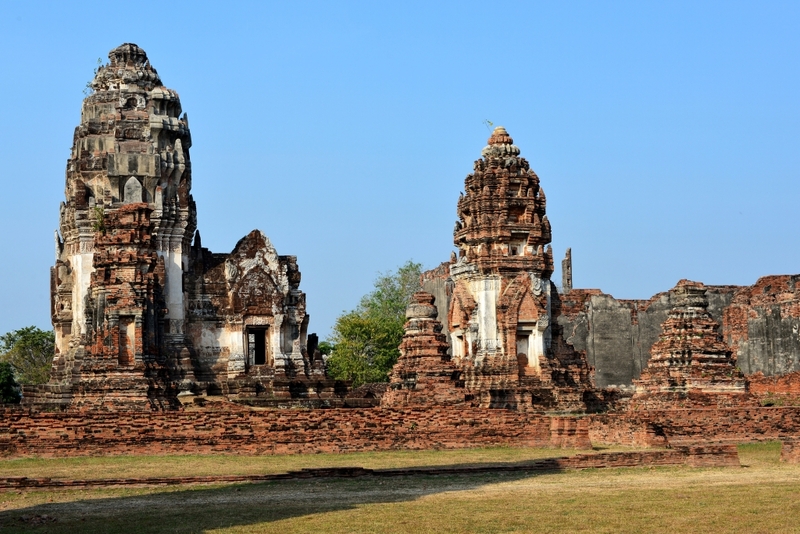 Thailand was central in the overland and maritime Silk Road trade routes that were in use over millennia, and played a crucial role in the cultural, political and economic development of the country. The Dvaravati culture that marked the country’s earlier state of development began around the 6th century and was strongly linked to the Hindu Indian culture. The culture spread through the country by means of river systems. 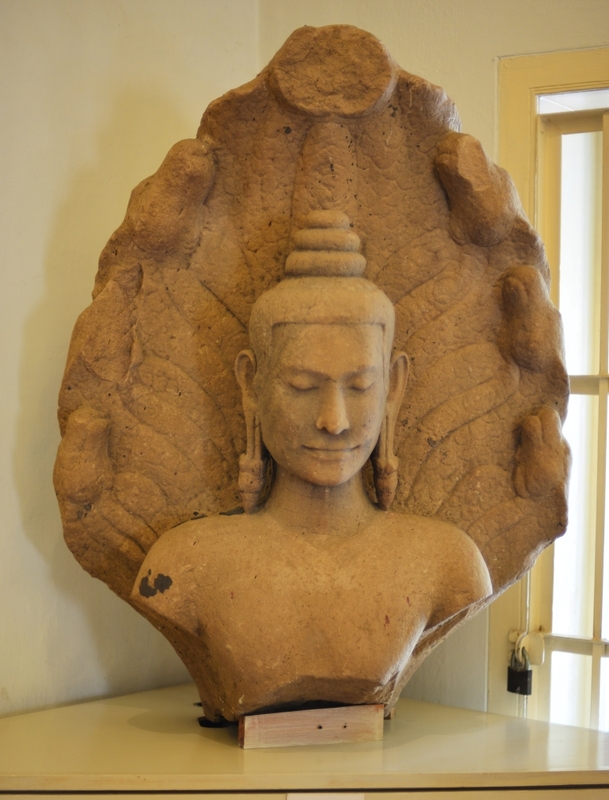 The Khmer culture supplanted the waning Dvaravati period by the 10th century, which lasted until the 13th century. The peoples’ belief system apparently went from Theravada Buddhism to Hinduism, and in the 13th century, to Mahayana Buddhism. 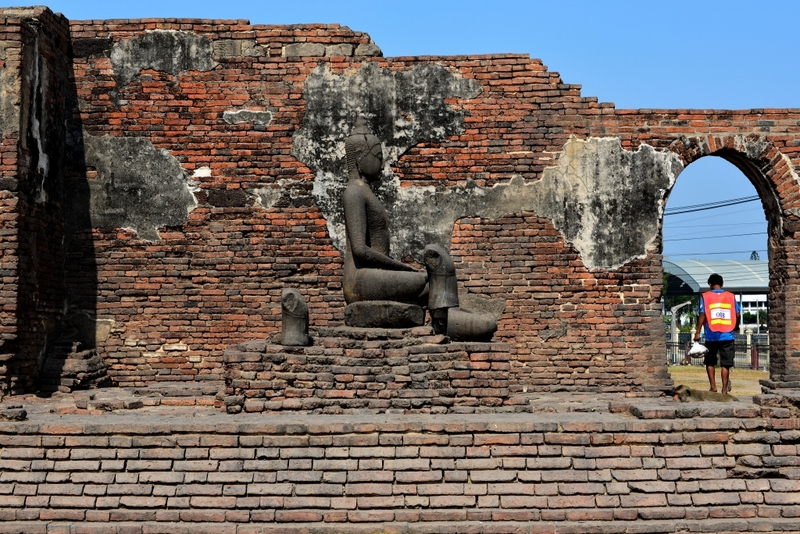 At the decline of the Khmer empire in the 13th century, Lopburi became the political centre for central Thailand, at which point they converted back to Theravada Buddhism. 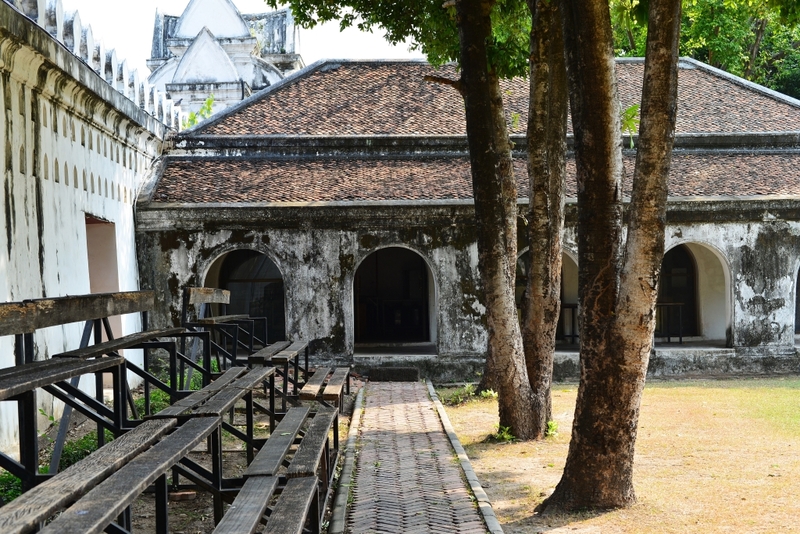 Outside the new palace of King Rama IV lie the remains of the ‘Dusitsawan Thanya Mahaprasat Hall’, where King Narai received foreign ambassadors. 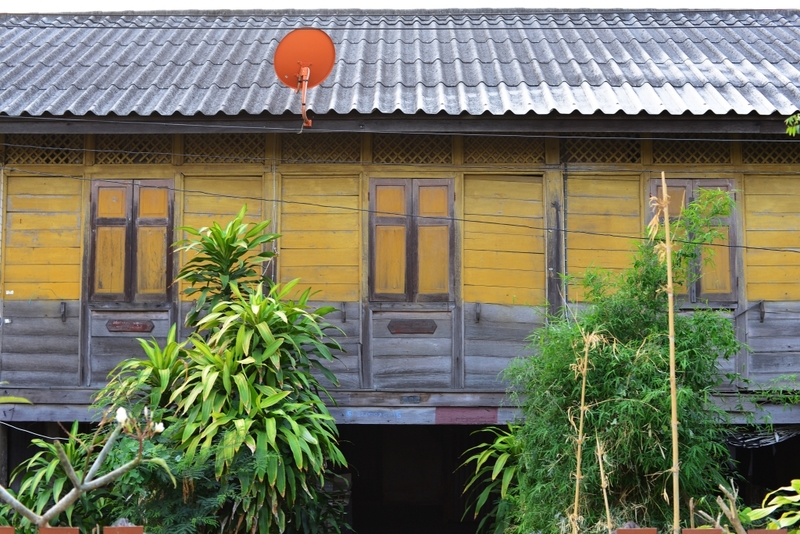 The structure is divided into two parts, the front with a high ceiling and the back with a raised floor and Thai-style windows and doors. The throne was situated in the centre, to which several staircases led, and on the throne the king granted audience to official visitors. The walls at the time were apparently covered in gilt mirrors, and the ceiling adorned with gilt decorations and crystals from China. 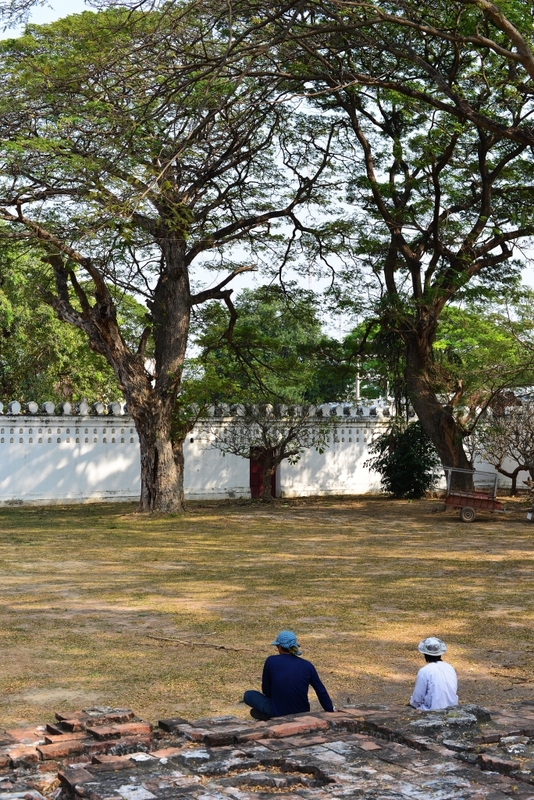 Workers serenely tend to the gardens of the royal palace, something I am very grateful for, considering that the short grasses go a long way to assure not stepping into any unwelcoming vermin. 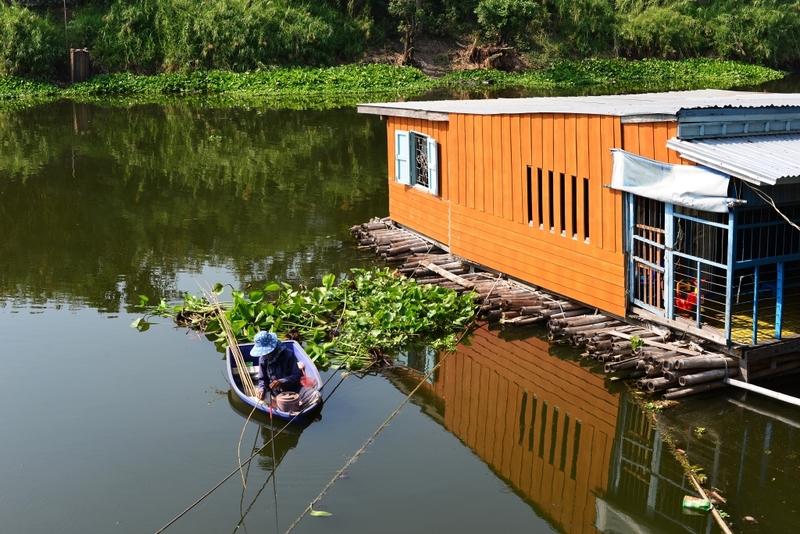 Actually, I shouldn’t quite describe the local workers as ‘serene’, as they are just stuck doing a thankless labour job in what is usually extreme heat for a pittance, although I suppose this would be better than having to slave on a construction site. I am not sure if photography is in fact prohibited or not in the museum, but no one stops me when I take photos without the use of flash. The physical state of the museum is excellent and the displays covering three floors exceedingly well curated, with impeccable glass vitrines showcasing relevant period art, informative plaques and a polished wood floor. 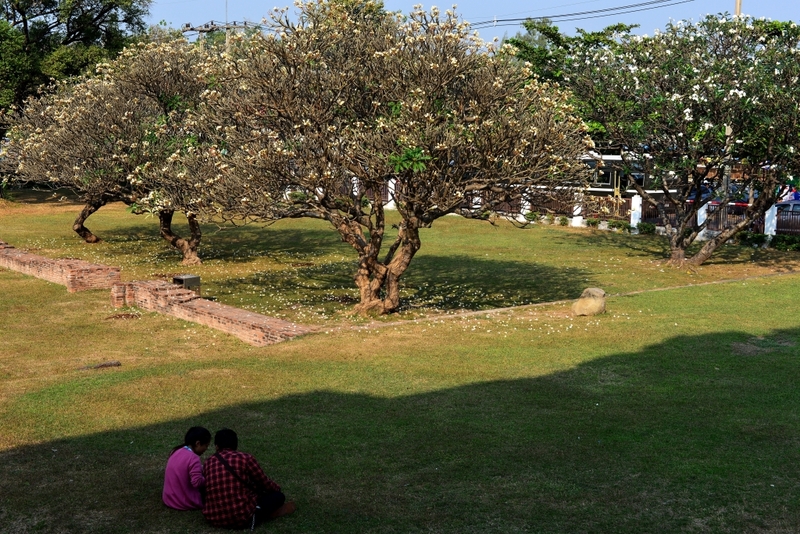 The museum contains an extensive display of religious sculpture, primarily representations of Buddha and bodhisattvas from the Lopburi region, the specific styles varying by age and cultural influence, be it Daravati, Ayutthaya, indigenous, or one of several subgenres of Angkorian. 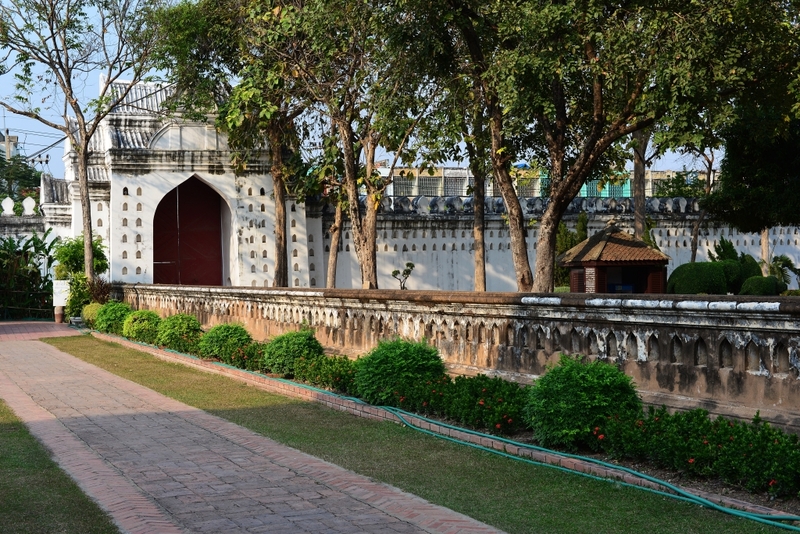 The proto-Hindu Daravati style could be further divided into three subcategories, including the early Daravati style, influenced by the Indian Amaravati and Gupta periods, the middle period, primarily locally determined, and the late Daravati period, increasingly influenced by Khmer sensibilities. Many objects from life in ancient times are presented and explained, including the likes of votive medallions, seals, and pottery. I take a photo of one of the demure women formally attired in traditional Thai prints, whose reaction to my desire to take her photo is instructive, neither rejecting me outright, but emanating a sense of distress, which gives a momentary desire to placate her in some fashion, although any attempt to do so would inevitably look ridiculous. I return to the Sam Anong cafe facing the palace gate for another coffee and to get some internet-based transactions out of the way, since the reception at the Nett hotel is so hopeless. Barely have I plugged the computer, logged into the wifi connection and brought up the internet, but who do I see in the glass windows but Julie! 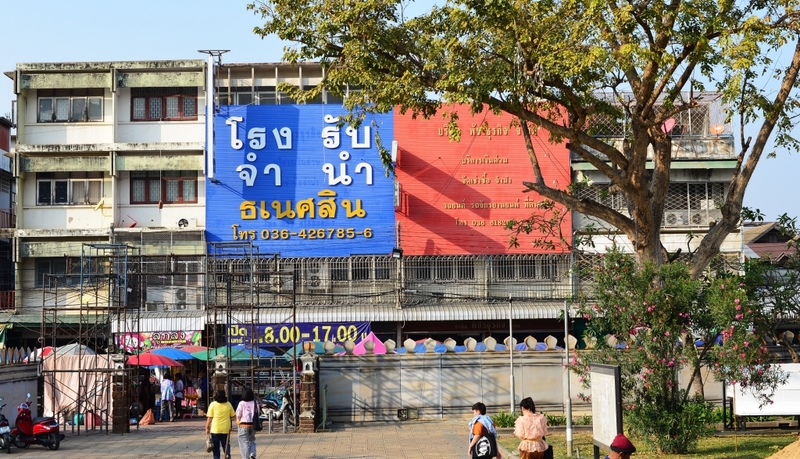 She arrived in Lopburi yesterday morning, and has already seen all the core attractions, and also managed to take in parts of the night market. She is currently staying at the hotel facing the royal palace, paying little for her room which is far from spectacular, except that it faces the royal palace complex, definitely a bonus. Had I bothered walking one block further! 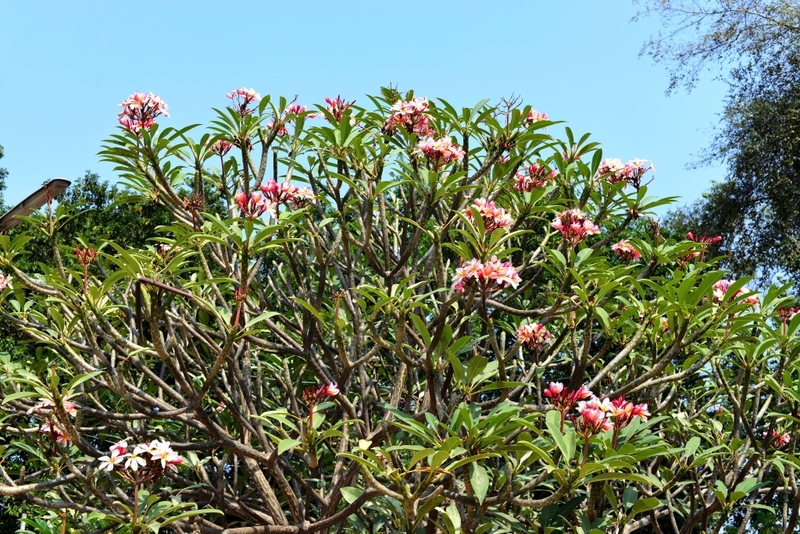 But so be it – I am leaving for Phitsanoluk tomorrow, and she is leaving for Sukhothai, but may have to take the train to Phitsanoluk before continuing to Sukhothai by bus. We leave the cafe, drawing a wide arc around the town, passing by some other historical structures from ancient times, traversing the train platform, then back onto the main road where the night stalls are setting up for the evening, having really found no memorable seated restaurants of any sort on our walk. 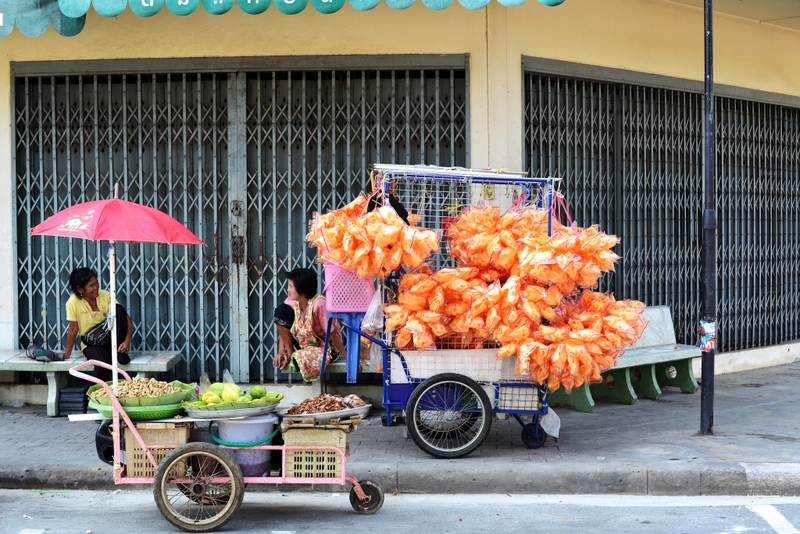 I would like to purchase a handful of the tasty pork dumplings from the Chinese-Thai vendor, and probably a few bowls of very average soup from the muscular, tattooed and not particularly friendly-looking Thai man who looks like he has definitive triad connections. The pork used for the soup is the usual chewy meat that originates from a pre-cooked and fried chunk hanging on a hook in the display booth, an East Asian standard that is never very enticing. I ask Julie to explain the fuss around Obamacare to me … Very simply, the big pharma companies have a huge economic clout, which they in no way wanted diminished, and so Obama had to accommodate them. Then those with existing private insurance do not want their degree of care diluted by people who have contributed nothing, resenting the fact that they pay so much and the poor will get the same quality of care. Those who have contributed financially and have historically been entitled don’t want to be sharing access to medical professionals with the poor, disenfranchised, illegal immigrants, etc. Young people are most vulnerable to not having medical coverage, although are usually to some extent covered by parents’ plans. She is very impressed by the extravagance of women’s wedding clothing, as crummy as the locals’ day-to-day clothing may be. But that is very typical, I tell her – the poorer the countries, the more of their relative wealth is transacted in weddings. She gets me to concede at least she has the nicer walk back to her hotel, the road leading up to one of the gates of the royal palace. Then back at the Nett hotel, the farce with internet access continues. Now they admit there is no access to the upper floors whatsoever, and if we want to use the internet, we have go sit at one of the tables clinging to the wall adjacent the parking area. I can’t even get the adapter plug of my power cable to not fall out of the wall power jack. This is utterly ridiculous! So much for the receptionist assuring me repeatedly that the internet at the hotel is normally excellent. It has been anything but, and every time I try getting internet at some cafe, I never have any problem. In the interim, I really need to take care of booking the flights back and forth to Myanmar. In the end I do book a one-way flight from Chang Mai to Mandalay with Bangkok Airways, despite the huge melodrama I created in Ayutthaya around the cost of the flight, as the Air Asia flights I had scoped out had not in fact displayed their own copious taxes, so that in the end traveling back to Bangkok to get to Rangoon would have taken roughly 1000 baht less than the direct flight from Chang Mai to Mandalay with Bangkok Airways – and they automatically include a 20 kg bag, which some of the other airlines do not. As an alternative, I tried researching some of the Burmese airlines offering service from Yangon to Bangkok but their web sites are hopeless.